mmo-champion has more companion pets for us! the dark phoenix hatchling has already been announced as one of the guild vendor rewards that must be unlocked by a guild in order to obtain (although that could change before the expansion goes live). and the fossilized hatchling has been confirmed to be part of the new secondary profession, archaeology. the other two... well there's no other information on either one of these yet. i have to say... the seagull i can fathom. we'll be traveling back and forth at sea a lot and not to mention to the new under water zone. it's a critter/creature that you would expect to see so it fits in quite well with the whole theme/scheme in cataclysm. but the armadillo? i was caught completely off guard by this one. since i haven't been on the beta in a while, i can only speculate that this will be a new critter/creature in the new 80-85 zones. otherwise... i can't see how it would fit into the game. i've never seen an armadillo or something even remotely like one in all of azeroth, outlands or northrend. it just makes me scratch my head a little. has been announced! and the winner is... *drum roll*... Deathy! the baby murloc/deathwing hybrid. LOL. there seem to be mixed reactions to the blizzcon pet so far. most either love him or hate him. i think he looks pretty silly but in a good way. personally, if i had done a deathwing themed murloc, i would have just created different colored murkys, then stuck deathwing halloween masks on them, and then have them do their best deathwing impression in "RwlRwlRwlRwl" speak. on a side note: the deathwing theme is starting to grate on my nerves a little. blizzard is really hyping up this dragon, hopefully not to a point where the actual in-game version and lore are a let down/disappoint. anyway, i now feel justified in ordering the online stream of this year's blizzcon. i can't wait to receive my dragon-inspired murloc pet in the mail! there may be a new elemental pet in cataclysm, an earth elemental to be exact. its name? pebble! very fitting, no? since i haven't logged on to see for myself, i can't say if this little guy is actually a companion or if it's just a quest item/NPC. however, after sifting through the beta forum posts, i know for sure that there is a quest chain in deepholm that involves summoning an earth elemental named pebble. whether or not players receive a pebble pet or similar companion of their own at the end of the chain or upon gaining a certain reputation with the Therazane faction, i have yet to find out. it would make a lot of sense if players did receive a pebble of their own or an earth elemental companion somewhere/sometime in cataclysm. blizzard did mention during the scorchling fiasco that they would be introducing baby elemental pets into the game in the future. much of cataclysm will be dealing with old gods, ancient beings and guardians, so it's not unlikely that we'll run into a faction or two of elementals. hopefully we get to interact with all the factions and receive miniature elemental non-combat pets. finally! as soon as the beta stabilizes and i can patch, i'll definitely be going to check out the pebble quest chain. even without a companion reward at the end, there's much talk of how awesome the chain is in general. we'll have to wait and see! an ever-changing game such as WoW will ultimately have ever-changing items. this isn't to say they get better or worse over time. it's not the end nor is it the beginning. change is just change. after some reflection of all the changes and possible changes to come with cataclysm, major and minor, i've come to the conclusion that i'm very grateful for my pet collecting experiences thus far (yes, even the pet peeves). one particular sentimental moment in time that i hold especially dear (amongst the many special memories lol) is when companions used to be actual items that took up bag and bank slots. i'm not saying that i wish things would go back to those days. no way. i adore the change to actually be able to learn the pet and thus freeing up my inventory space for other useless junk. but during those days when one pet meant one less slot, there was one companion that made having the actual item (vs having a trainable spell) worthwhile. the captured firefly, while seemingly insignificant now, holds special meaning for me and probably for many other old-timers out there. 1. first the guild must unlock the item through guild achievements and/or other feats. 2. secondly, you must have the correct guild reputation. 3. lastly, you must have enough gold (i guess?). mmo-champ has news that blizzard has officially released information for the cataclysm collector's edition. i still haven't decided whether or not i'll be getting the collector's edition. to this day i have yet to own ANY of the world of warcraft expansion CE pets (mini thor is kind of an exception since it's technically not wow heh). i don't know if i want to break this tradition of "missing" CE companions, or if i want to splurge and finally get my first one. it's a trivial dilemma, but a dilemma nonetheless. as mentioned in a previous post, alliance players will have a new companion quest reward from darkshore in cataclysm. there was some speculation that this pet may not make it into live since there didn't appear to be any horde equivalent, however thanks to some comments on the beta forums, it's confirmed that withers is available for horde too! withers is purchasable from an undead NPC named apothecary furrows, located within the cliffspring falls cave in darkshore. he sells the companion for 30 silver. note that he is also an NPC that alliance need to kill to obtain a quest item, so if he isn't there when you visit the cave, wait a few moments for him to respawn. 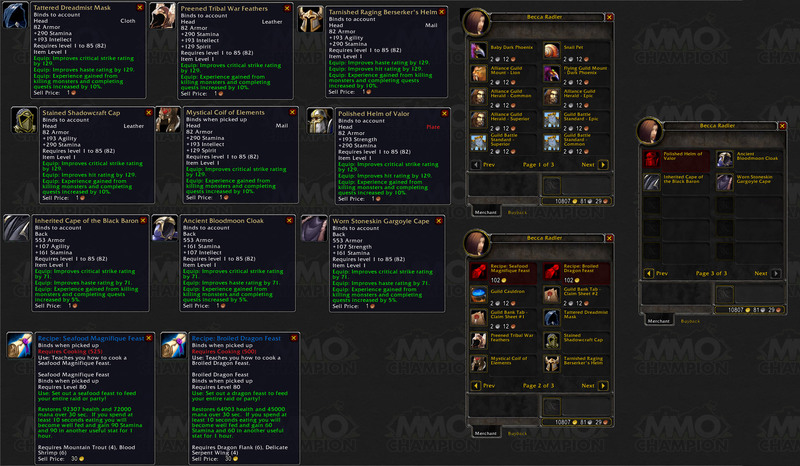 mmo-champion brings us a preview of the vendor goodies that will be available once you've unlocked certain reputations with your guild (i think?). two things to note in this screenshot of what the vendor will possibly offer: baby dark phoenix and snail pet!! i'm very excited and eager to see what the snail pet looks like! eee! wowhead has yet to update its cataclysm database with any information on these two possible companions, so we'll just have to wait and see for now. 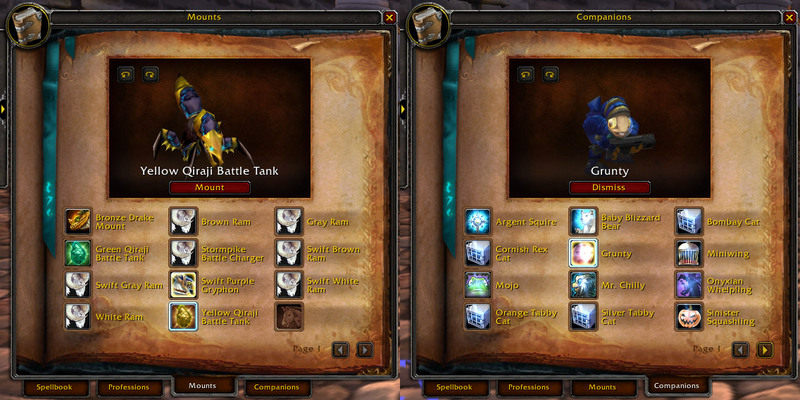 mmo-champ also has a screenshot of the new companion/mount UI layout. i'm a little disappointed that there is still no search feature for the companion pet tab. it's nice that the names of the pets are plainly visible now and makes it slightly easier since it's in alphabetical order, but after 10 pages of pets... it just seems like a good idea to add a search feature. especially for those of us who have memorized companion names and know exactly which pet we want to bring out at any given time. instead of scrolling through the pages, it'd be convenient if we could just type it in (similar to the profession tab search feature) and have that pet pop up, yenno? all these changes and updates makes me want to finally take the dive and patch my beta client *insert groan here* but we'll see what i have time for. :P i'm most interested in the guild vendor and what she/he has to offer us! the dark phoenix mount looks pretty amazing, so i can just imagine how gorgeous the companion will be. it's confirmed! the personal world destroyer i found on wowhead.com will be one of the new engineering pets in the expansion. it looks like a blue, miniature fel reaver. i can't wait to see what type of animation (if any) he has. the peeve that i have is blizzard's ever changing mind about certain items. the engineering pets prior to wotlk were exclusively engineering pets. there was no other way to obtain them other than to have engineering yourself. once wotlk rolled around, that changed and the profession specific companions became bind on use. the AH is flooded with lil' smokys and bomblings now. part of me understands that this is a game of change, and you can either go with the flow or get left behind. but on the other hand, it's quite frustrating that blizzard changes their mind as if on a whim. many collectors felt as though all their efforts and energy were belittled because of this. after all of the time spent to switch back and forth between professions and suddenly the pets are handed to people? it was quite an outrage for some. for me, i'm a bit torn. i did feel as though my hard work suddenly became a bit meaningless, but i still held onto the memories of that night so it was still worth it. it was quite an adventure, actually. one that seemed endless and a bit of a headache since i kind of just winged it without looking up a guide or anything lol. despite the change and the irritation that came along with it, i've gotten over the whole thing and i wouldn't have it any other way. i'm happy for all the collectors, who didn't switch professions, who can now own a lil' smoky and pet bombling of their own. what blizzard will end up deciding on, to keep the new engineering pets BoP or to make them BoU come the release or to even switch it from BoP to BoU at a later date (like they did with the previous engineering pets), who knows. we'll just have to wait and see. they won't be able to make everyone happy, but i hope there is a balanced compromise. maybe one pet bind on use while the other bind on pick up? heh. whatever the case may be for the cataclysm engineering companions, i know that i'll definitely be putting them on my "to do" and "to get" list. even if it takes me some time to build up the courage to make that giant profession switch, i'll get them eventually! WarcraftPets.com brings us news of... a crawling hand pet..?! there's even a neat video of it in action. apparently you can play rock, paper, scissors with it. interactive pet animations... HOORAY! to be honest, when i first saw it... i couldn't believe that it was a companion. it was just too amazing and cool to be one. i thought that it was for sure some sort of NPC or NPC's pet that we could interact with. but after searching through wowhead and finding the telltale "Right Click to summon and dismiss your crawling hand" my doubts are slowly fading. i refuse to get my hopes up though. companions and their "uncategorized spells" have been datamined before, but that doesn't mean that they always make it into the live release of the game. i'm just going to wait this one out before i start getting too excited. with all of the disappointments and let downs concerning pet collecting lately, i don't want to go through another emotional roller coaster over a companion that hasn't even been confirmed for release yet. even so... it's a very very very very awesome pet that i would love to add to my army! we all knew it had to happen some time. this was inevitable imo. i'm slightly tired of seeing the same whelp design (similar idle animations, model, etc.)... but i gotta admit, he's pretty cool looking. i hope he has an awesome interactive animation. something epic! but we'll see. there's no word on if and when this little guy will be available. could be the cataclysm collector's edition pet, it could be the blizzcon 2010 redeemable in-game item, or it could even be another blizzard PetStore item. either way, i can't wait to find out how to get my hands on him.